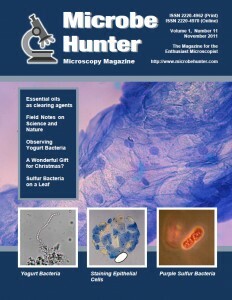 Certain essential oils have previously been used in microscopy as clearing agents. While they certainly smell better than xylene do they actually perform? Why report back only the successful microscopy attempts? This one resulted in quite disappointing images. Smartphones as microscopes, scanners that scan slides instead of traditional microscopes…. Where will the future take us? Pictures by Anthony Thomas and Manfred Rath. Keep a scientific notebook which documents your observations! A book review. What are the areas of applications of polarizing microscopes? A Wonderful Gift for Christmas? How well do toy microscopes perform? Wilhelm Resch bought one to give it a test. Yogurt bacteria can be observed in a wet mount or after heat-fixing and staining them. A magenta-colored bloom can be an indication for the presence of purple phototrophic bacteria. Here, aggregates of these bacteria were found on a decaying leaf. Regular fountain-pen will stain epithelial cells.